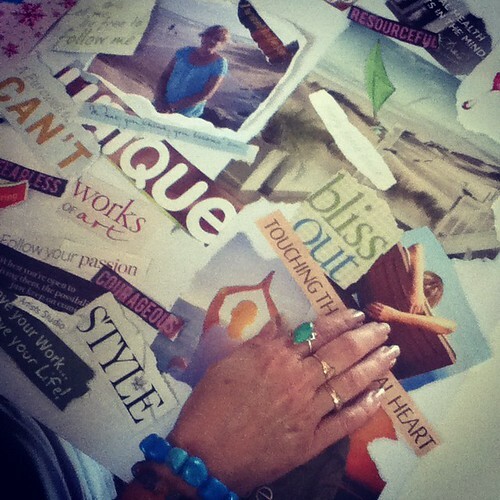 Every January in-between the NEW & FULL MOON, without fail, you will find me creating a visionboard for the year ahead. I would usually plan this to coincide after the new moon and before the full moon in the “Big Dreams, Small Wonders” online class and host an in-person event at my home (with friends, snacks and lots of lovely champagne!). 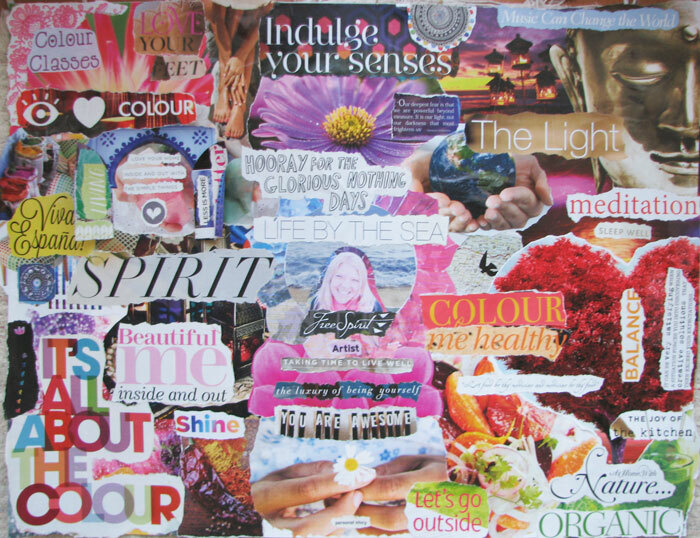 My “word of the year’ has been emerging, so more on that after the vision board! I know many of you are raring to get going, so here is my annual “how to” to help you get started. It is so much fun! Before you vision your year ahead, it is also a really great practice to review and celebrate what has passed, you can work through many of the processes I do for each year in my FREE Big Dreams, Small Wonders Planner. collaged on to it. The purpose is to create a picture or vision of what you want to attract into your life; this could be where you’d like to visit or live, changes to your existing environment, life or how you would like to feel. From personal experience I have seen the power of these beauties from leaving my job and reconnecting with a creative life in 2010, moving to a home with a studio in 2011, living a more simpler life in 2012 and changing my life completely and moving to Spain in 2013! 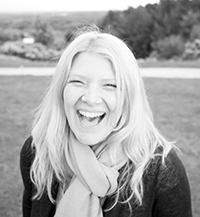 In 2014, it was more about how I wanted to feel and slowing life down a little! (I also manifested a trip to Morocco!). 2015 and 2016 were all about nature, creating and enjoying life by the sea. 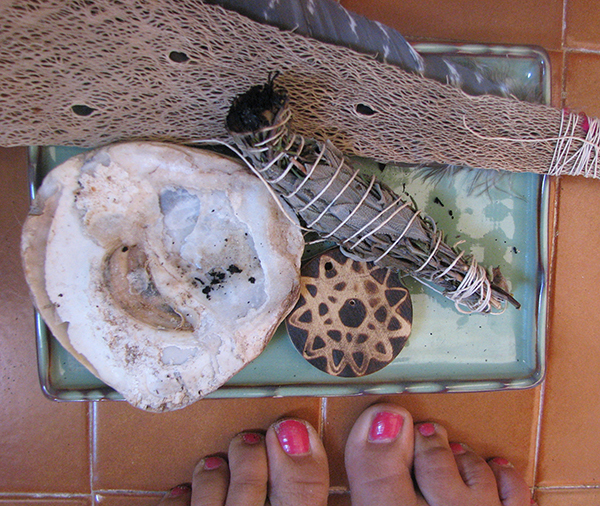 Photo from ‘Your Awesome Year Workshop‘ I ran with Cathy Kirwan, January 2012 in Australia. Thick card or poster board of any size. 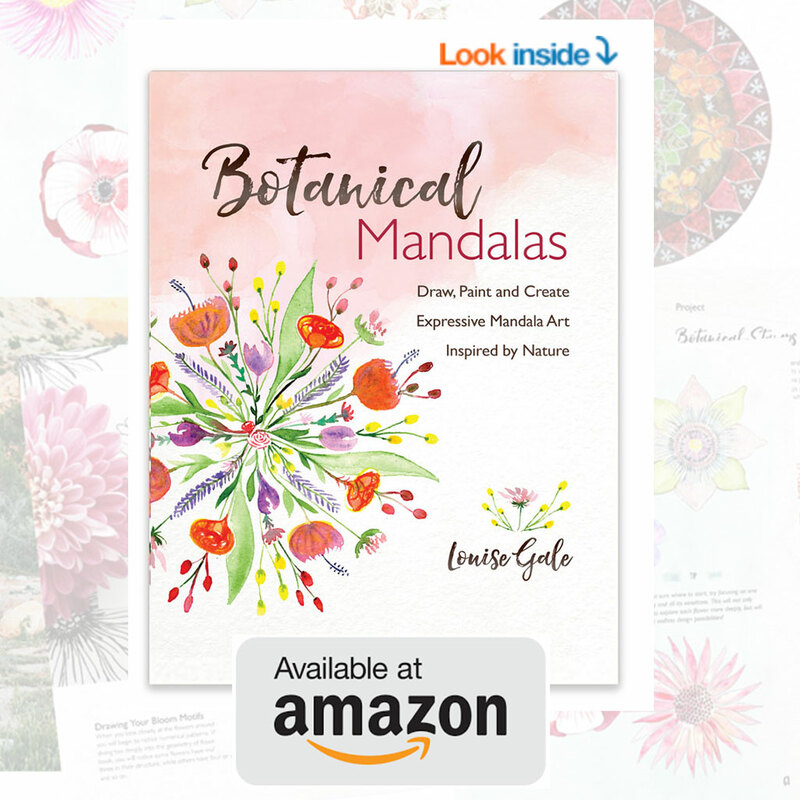 Glue – I like to use acrylic medium which is what I use in my mixed media creations or modge podge – I find it doesn’t ripple the pages like elmers does and lasts longer than a regular glue stick. Remember you don’t have to do this alone. You can invite your family and close friends to take part. Put on some uplifting or relaxing music and breathe deeply. If you can find yourself a space where you wont get interrupted or plan an event with friends, even better! Close your eyes, focus on what you would like to invite into your life. Set the intent for the activity. Lots of smudging in my house! You know you want to make a change but just not sure how and what. Start to go through your magazines and simply tear out images that speak to you, don’t ask why yet, just continue to collect the images and words. Once you are done with collecting these, look through and ask yourself what this image or word might mean for you. If you are not 100% sure, but really like the image or word that’s okay, still put it onto your board, the answer will present itself soon enough. Let your heart and intuition guide you. 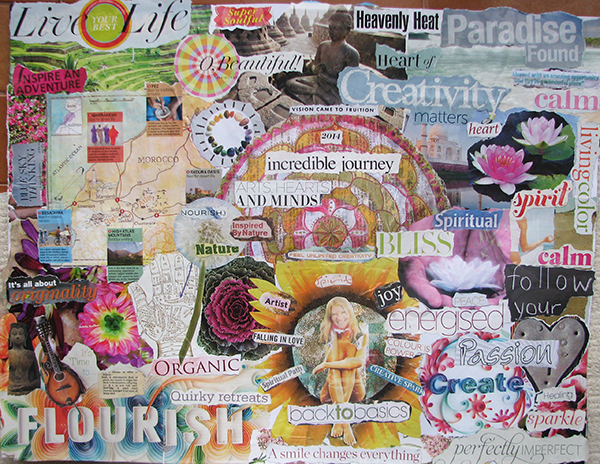 Create this vision board if…. 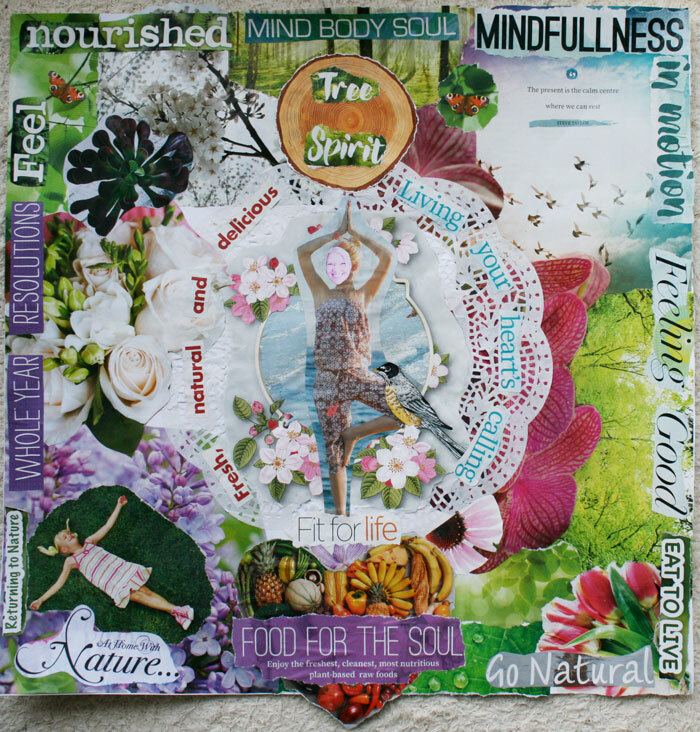 Go through your magazine and look specifically for images and words you know you want to manifest or bring into your life. i.e. I wish to live in the country and have a veggie garden – look for images of vegetables, countryside and all things relevant. As above, go through and choose images and words aligned with your theme. This can also be very much like a design mood board. I like to use these on pinterest mostly to collect images of lets say, a space I want to decorate or how I want my balcony to look in the summer. and…. 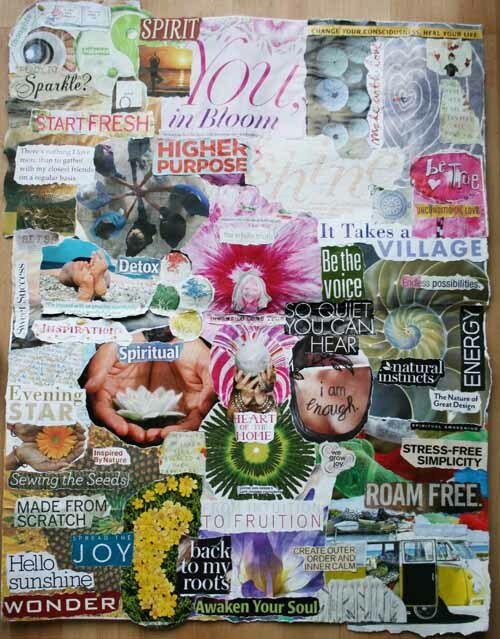 of course in addition to the visionboards above, you can also create a monthly collage to dive deeper through full moon dream boards. 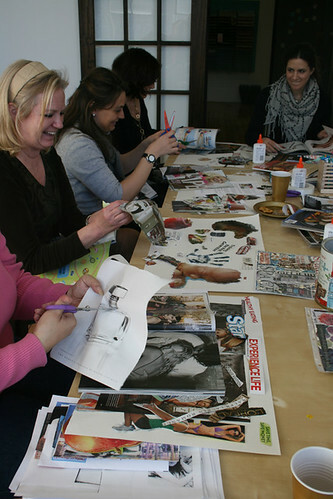 Go through your magazines and start collecting images and words that resonate with you (don’t glue anything yet!). Don’t rush, this is a powerful exercise to attract your visions. Then grab the images and words you have collected. 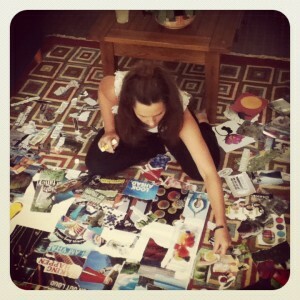 Start to go through your images and lay them out on your board. This is highly intuitive part of the exercise so feel free to move them about, take out ones that no longer feel right, you may see a theme starting to emerge. Firstly position a photo of yourself right in the center, smiling happily to show the expression when all these things come true in your life. 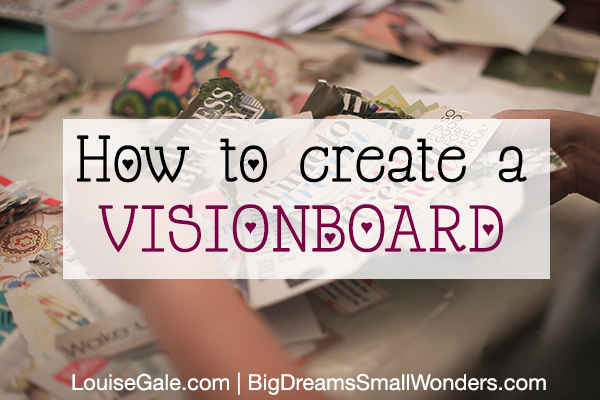 When you are ready, start to glue your images and words onto the board. You can also draw and add additional words yourself as you build your imagery. When you feel like you have completed your board, hang it somewhere prominent for you to see everyday. There’s no right or wrong way here, just go with your instincts and be open – this is the most important thing. You may be surprised with what comes out! Enjoy! 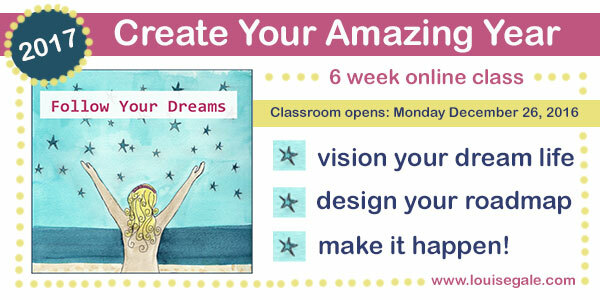 If you would like to dive deeper into dreams, manifesting, setting goals (you will keep) and creating an amazing year ahead, come and join me in the ‘Big Dreams, Small Wonders‘ online class. Still time to sign up, would love for you to join us. More information here.